For those who regard cooking fish as difficult and demanding, frozen pollock is a gift. Delicately-flavored and fine-textured, frozen pollock is customarily cooked without thawing, making it easy for beginning fish cooks to handle. The mild filets are suited to a wide range of seasonings and cooking methods, letting you cook this healthy protein just the way your family likes. Pollock is a lean, white, firm fish usually sold as frozen filets. The two most frequently available varieties, Alaskan and Atlantic, strongly resemble one another and can be used interchangeably in recipes.Pollock can also be used in recipes for other mild-flavored fish like grouper, haddock or, with gentle handling, cod. The fish may sometimes be packaged in a frozen block, but is more often available in individually-frozen, ice-glazed filets. Thaw a frozen block of filets in cold water just long enough to separate them, then continue with cooking. Because they are thin, individual filets need only the ice glaze washed off, then can be cooked quickly while still frozen. Three minutes per side in a saute pan is often long enough to produce perfectly-done fish. Pollock can also be baked, simmered or steamed. Rinse the ice glaze off filets and pat them dry. Melt a pat of butter, a tablespoon or two of olive or other healthy oil or a mixture of butter and oil in a saute pan. Over medium-high heat, saute filets three minutes per side. For a quick pan sauce, set the filets aside and add a small amount of white wine, lemon juice, chicken broth or rice wine vinegar to the saute pan. Scrape any brown bits into the sauce and finish with a grating of lemon zest, a spoonful of capers or a handful of finely chopped herbs, like parsley, dill or basil. Return the filets to the pan and serve with the sauce. Give rinsed, dried frozen pollock filets a baking head start by spacing them on a sprayed cookie sheet in a 400-degree Fahrenheit oven for three minutes. Use the baking time to assemble ingredients for a baking sauce. A tomato sauce based on the ingredients used in bruschetta or finely chopped onions and peppers tossed with Southwest seasonings are both quick to assemble. Frozen stir-fry vegetables with an Asian sauce make another quick veggie-fish casserole. Oil or spray a baking dish, sandwiching filets between layers of sauce and return to the oven for 10 minutes. For a juicier baked fish dish, tent the baking dish loosely with aluminum foil, letting steamy juices return to the dish. Clear Asian soups often feature seafood ingredients. Poach pollock filets gently in broth seasoned with a little soy sauce, ginger, lemon grass and scallion. Keep the heat low and watch for the flesh to become opaque, which will happen within three to five minutes. Add substance and charm to your soup by warming a few cooked shrimp in broth before serving. 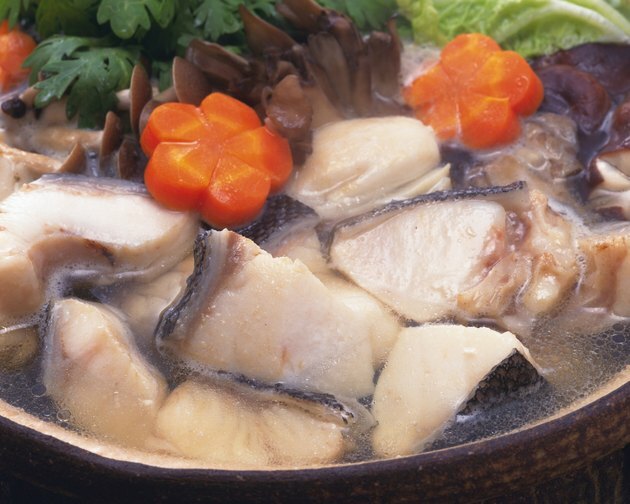 For poached fish without soup, reduce the liquid to a level that just covers filets and simmer, covered, over medium-low heat just until the fish is flaky. Vary poaching liquids with lemon-water, tomato juice, clam juice, white wine or chicken broth. While the Korean name Dongtaejeon loosely translates as "fish pancake," Western eaters might describe these battered filet slices as fish-chips. Coated in a simple egg-flour batter, thin-sliced pieces of frozen pollock are briefly sauteed in a small amount of olive oil over medium-high heat in a nonstick pan. While thickly-battered deep-fried fish products damage the nutritional benefits of fish, you may occasionally enjoy experimenting with lower-calorie crunchy versions like Korean fish pancakes.